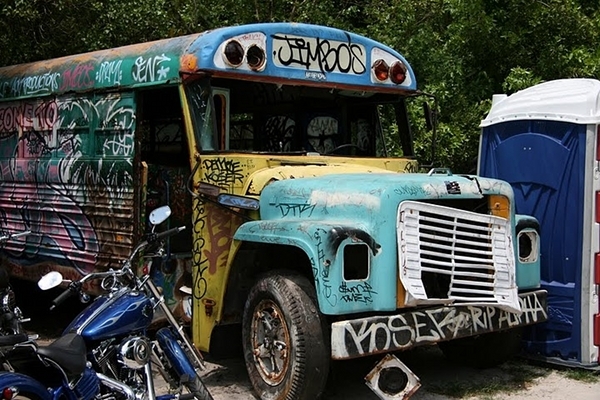 You mean not every bar has a bus covered in graffiti outside it? Jimbo’s Place in Virginia Key. Photo and feature: Vivek Chugh. If you’re living in or traveling to the Magic City, you’ll notice the abundance of high-priced nightclubs. Cover charge often starts at $20. Drinks at these places are about $8-15 for a beer (Bud Light being the cheapest) to about $15-25 for a mixed drink or a shot. HOWEVER, WITHIN the insomniac mess and expense, there are dive bars, and here are my favorite 10. Situated inside a Floridian apartment building, you have to ring the doorbell on the locked side door next to the lobby and be checked out by the camera before you’re let in. No one is ever turned away (at least, I have never heard of anyone being turned away). Inside the bar, you’ll have a view of the bay, free pool, free darts, a juke box but the best part: it is definitely one of the cheapest places to get a drink in South Beach. The cost for a domestic beer is $2 and a mixed drink is $4-5 dollars. The veterans and the bartenders are friendly, just don’t be shy and they’ll start sharing their stories. Club Deuce. Photo: Vivek Chugh. Mac’s Club Deuce has been famous since “Miami Vice” – Anthony Bourdain frequents it when he is in Miami, and locals of all sorts will be here until 4 AM. So come around, sit down, listen to the jukebox or play pool, and you might even see Keith Richards. Opened in 1912, Tobacco Road and considered the oldest bar in Miami, it is famous for the happy hours, the daily specials, and the giant burgers like the “Death Burger” – topped with sauteed onions, jalapeno peppers, and jalapeno cheese. On any given day, they have at least 3 rooms with live music. A short walk from commercialized Lincoln Road, Abbey Brewing Company is a small, cozy dive bar on a side street in SoBe. They serve their own brands of award winning ales and drafts. There is free darts and the bartender plays a mix of tunes from his iPod. 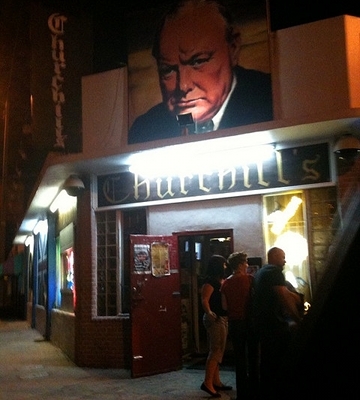 Located in Little Haiti, this English pub is a go to spot for live music. The food is great, the portions are gigantic, and the pub has a lot of musical history. Marilyn Manson played here as did The Slackers, Agent Orange and others. Just don’t forget to pay the locals a dollar or two to watch your car or else you may be taking the taxi back. You will have a local homeless person come around and say something like, “Give me a dollar and I’ll watch your car.” I have had only good experiences at Churchill’s Pub, but once in a while, I’ll hear people being belligerent to the homeless people in the area, just to have their cars scratched or stolen later on. The Lost Weekend has pool tables, darts, air hockey, cheap drinks, and a jukebox with great tunes. Though right down the street from the major clubs, it’s not a “typical” SoBe bar. Ted’s is located in the SoFi (South of Fifth) area, next to the restaurant Big Pink. In addition to the strong drinks and the pool table, this place is always filled with locals and classic rock is always playing. And on occasion, an Elvis impersonator may show up. While it has “lounge” in the name, I see Purdy Lounge as a new generation of dive bars. It has cheap drinks, two rooms, DJs, pool table, board games, and pixelated video game paintings on the walls. The bar at Jimbo’s. Photo: Vivek Chugh. To get to J place you’ll have to cross Biscayne Bay and head to Virginia Key. The film and entertainment industry has been using the place as a location for years (for example, Burn Notice and Bad Boys 2). The shacks were put up by a film crew in 1980, and they’ve been there ever since. It’s those shacks that have been a part of the city of Miami’s trying to shut it down. So far, it’s still open. Jimbo is the cigar-smoking, bocce-playing owner who’s been running the place since 1954. If you have a boat, then pull along to the dock, otherwise drive over, and tell the guard at the front gate that you are going to Jimbo’s. 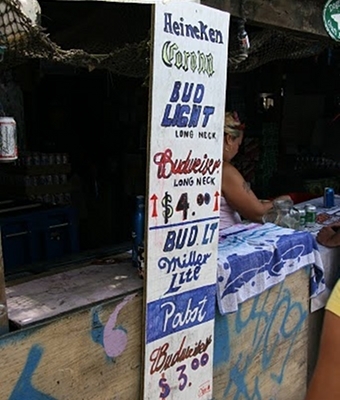 Park yourself at one of the lots, go get yourself a cheap beer, eat Jimbo’s legendary smoked fish, and enjoy yourself. Go to Calle Ocho in Little Havana, or go to any of the more Latin Quarters. Going to the bars in Calle Ocho is like stepping out of the United States and into Latin America. No one speaks anything but Spanish. When you first walk in, if you are not Latin, you will definitely get stared at. It can be a bit nerve wracking at first; however, just order a beer in Spanish, act friendly, and you should have no problems.